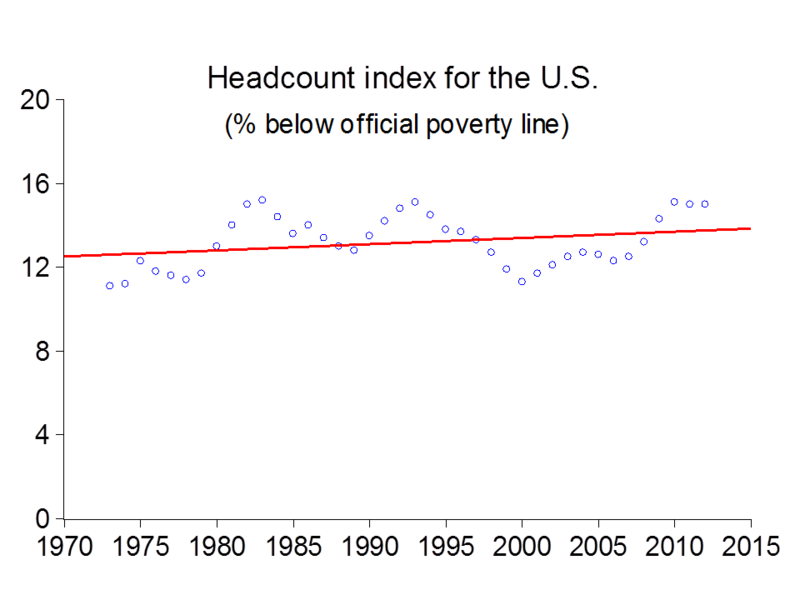 One of the world’s richest countries has seen remarkably little progress against absolute poverty over the last 40 years, as can be seen from the following graph, based on the U.S. Census Bureau‘s estimates using the official poverty line. At around $13 per person per day in 2005 (for a family of four with two children—about $16 a day in 2014), the official poverty line in the U.S. is roughly 10 times higher than one finds in the poorest countries. However, the U.S. line is low when compared to other similarly rich countries today. 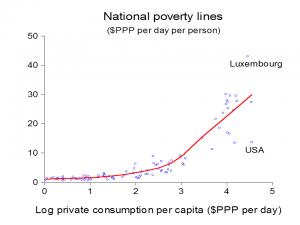 At roughly the same average income, Luxembourg has a line of $43 a day. A better comparison is with the average value among the rich countries, which is around $30 a day, roughly double the U.S. line. 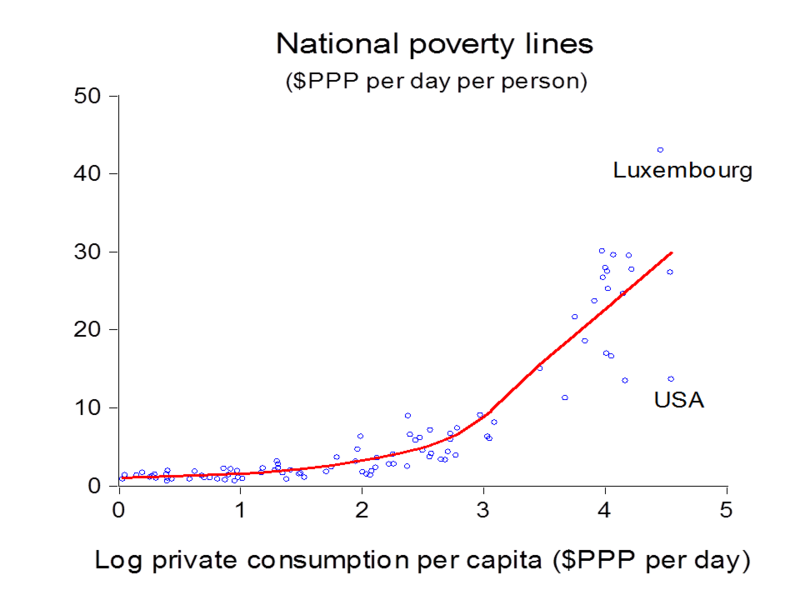 In fact the U.S. line is the average line for countries with only about one third of the mean consumption level of the US. For more on the debates on the US poverty line and proposed alternatives see EOP (Chapters 2 and 4). For more on poverty lines and how they are set Poverty lines across the world. 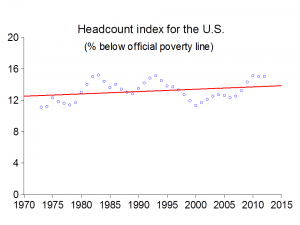 The following graph gives estimates of various poverty measures for the US. Three poverty measures are given, namely the headcount index (H), poverty gap index (PG) and the squared poverty gap index (SPG), all using the official poverty line. The graph gives the measures before and after the gains from the Supplemental Nutrition Assistance Program (SNAP), often called “food stamps”. This is America’s largest antipoverty program, covering about 14% of the population. SNAP aims to help poor recipients cover their food spending. The three measures track each other over time quite closely. SNAP lowered all three measures. Source: Ravallion, Martin, Dean Jolliffe and Juan Margitic, 2018, “Social Protection and Economic Development: Are the Poorest Being Lifted-Up or Left-Behind,” NBER WP 24665. As is well known, America is experiencing a marked rise in top incomes, with relative stagnation of middle household incomes. But what is happening at the other extreme of the distribution? Are America’s poorest families seeing some progress? The lower bound of the distribution of levels of living can be termed “the floor.” This can be thought of as the level of income below which very few people are likely to be found for any reasonable length of time. This can be above (hopefully well above) the biological floor needed for survival. If rising top incomes are “trickling down” to the poorest then we should see the floor rise over time. To see if this is happening, the paper “Social Protection and Economic Development” (SPED) uses survey data to measure the floor for the US annually spanning 1988-2016. There are a number of methodological issues in measuring the floor, as discussed in SPED, which gives results for various measurement assumptions. Importantly in this context, it excludes SNAP. The following Figure gives our estimates of the floor before and after SNAP. Since the official poverty thresholds vary by family size and composition, it is simpler to express the floor as a proportion of the threshold. The mean post-SNAP floor is about 36% of the official threshold. For a family of four, with two adults and two children, the threshold was about $16.50 per person per day in 2015. The floor in that year’s prices is $5.89 a day post SNAP, while the pre-SNAP value is $5.40. We see that the floor has tended to fall over time. The trend rate of change in the post-SNAP floor is -1.3% per annum. About half of the overall decline in the level of the floor is in the period 1996-2001, coinciding with various social-policy reforms (SPED). The floor stabilized over 2003-12. There is no significant trend in the post-SNAP floor after 2003, though the fall in the pre-SNAP floor continued, albeit at a slower pace. However, the last few years indicate a worrying resumption in the floor’s downward path even post-SNAP. Standard measures of poverty may reveal nothing about whether the poorest of the poor are being lifted-up or left-behind. This can be seen by comparing the last two Figures. For example, the periods 1993-2000 and 2012-16 saw declining poverty measures but a sinking floor. And the sharp rise in poverty measures in the crisis period (2008-10) came with a relatively stable floor post-SNAP. The proportionate changes over time in the floor are roughly orthogonal to those for the (post-SNAP) headcount index and are not strongly correlated with changes in PG and SPG. We see that foods stamps lifted the floor. Over the whole period, SNAP raised the floor by about 50 cents per person per day on average. The program also helped stabilize the floor. Our results suggest that without the “SNAP stimulus” the floor would have fallen even further in the wake of the 2008 financial crisis. Less encouragingly, we also find that the efficiency of SNAP in reaching the poorest (the gain in the floor per $ spent on the program) has declined over time. However, it is clear that SNAP has helped America’s poorest. The following Figure plots the per capita pre-tax incomes of various quantiles, including the top 1%—the income level above which one finds 1% of America’s population. Call this q(99). The graph also gives the quantiles for 95% and 90% as well as the mean and median (q(50)). We see a marked absolute divergence—roughly speaking, a rising absolute gap between richest and poorest. While the growth rate of the floor over the period is -1.3% per annum, the growth rate of q(99) is 1.6% per annum. For a family of four, the floor fell from about 9% of q(99) in 1988 to 4% in 2016. So there is also marked relative divergence. A caveat here is that there is likely to be a downward bias in survey-based estimates of the incomes of the rich. For example, the estimates combining CPS with income tax and national accounts data in the Worldwide Inequality Database indicate a higher growth rate for the top 1% than found using the CPS alone. If anything, the true extent of the divergence is even greater than we see above. The fall and rise of inequality in the US has attracted much recent attention. These two graphs tell the story very well. EOP Chapter 2 discusses the reasons. The data are from World Top Incomes Database and are based on income tax records. The reported incomes are pre-tax and does not include government transfer payments.